Mimi Hoang joins a discussion about designing for an equitable and inclusive workplace, Oct. 26th. Eric Bunge joins a panel discussing affordable, inclusive solutions for expanding cities. Eric Bunge and Mimi Hoang discuss designing buildings to interact with the city and its occupants, in Columbia's 'GSAPP Conversations' podcast. Mimi Hoang discusses housing at the University of Miami School of Architecture's Fall Lecture Series, Oct. 11th. Principal Mimi Hoang and Associate Principal Ammr Vandal are published in the Council on Tall Buildings and Urban Habitat's Special Issue: "Women in the Tall Building Industry." Mimi Hoang joins a discussion on "Building Balance: Culture, Context & Inclusion in Design," Hosted at WantedDesign, 5/21 at 11 am. Shanghai Library East Hall is honored with a Jury Award in the Institutional (Unbuilt) category. Mimi Hoang participates in Harvard GSD's "State(s) of Housing" Colloquium, March 30. Eric Bunge discusses the work of nARCHITECTS at the Université de Montréal, 3/21. Ammr Vandal joins the Architecture League of Northern New Jersey for a discussion on "The New Micro Living," 3/16. A/D/O receives a 2017 Design Merit Award in Architecture from AIA NY! 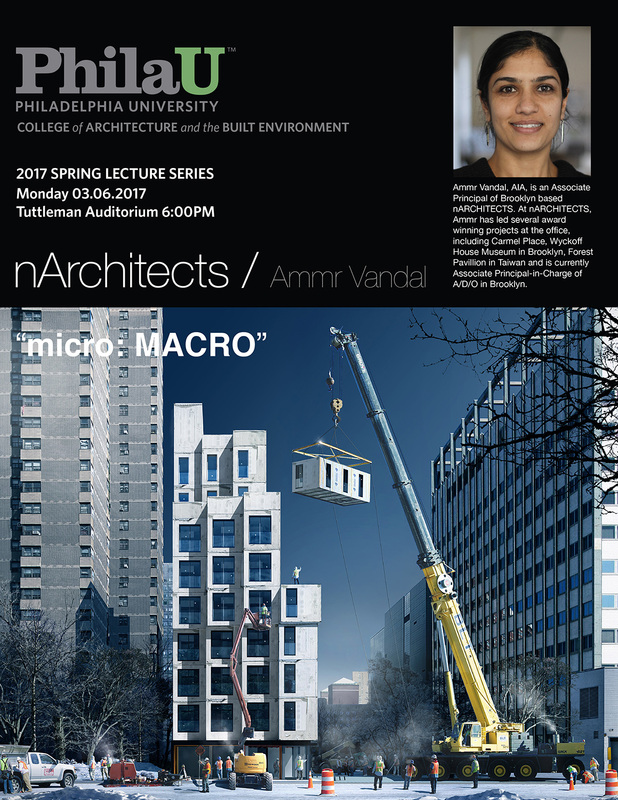 Ammr Vandal speaks in PhilaU's 2017 Spring Lecture Series, March 6th. Eric Bunge represents nARCHITECTS in AIANY's panel discussion "Turning Points," March 1st @ 6pm. Mimi Hoang presents at the City College of New York housing workshop, Feb. 24th. Principal Eric Bunge presents the work of nARCHITECTS for the Georgia Tech School of Architecture spring lecture series, February 3rd, 2-4pm. Carmel Place is recognized by AIA National with a 2017 AIA Institute Honor Award. nARCHITECTS' design for a diesel monitoring station in the Harper Street Yard for NYCDOT approaches completion. Curbed New York lists A/D/O and Carmel Place NYC's Best of Architecture for 2016. Carmel Place selected as a finalist for the 2017 ULI NYC Excellence in Development Awards. Mimi Hoang and Eric Bunge present Carmel Place at the National Arts Club, Dec. 14th. Construction of nARCHITECTS' design for A/D/O, a creative work space founded by MINI, has been completed. The space will open to the public following the holidays. Residential Architect Magazine recognizes Carmel Place with a Citation for Affordable Housing in the 2016 Design Awards. Mimi Hoang participates in a panel discussion entitled "New DomestiCITIES" during PennDesign's Under Pressure Symposium, Oct. 28th. Mimi Hoang + Eric Bunge kick off 'FrogNY Presents:' with their talk "Buildings+Almost Buildings." Carmel Place celebrates building completion and full resident move-in with a ribbon-cutting ceremony, Oct. 27th. Though under construction, nARCHITECTS' warehouse renovation, A/D/O, has served as the venue for Open House New York's Launch Party and the 2016 ALNY Beaux Arts Ball. "Making Carmel Place" debuts at the Architecture and Design Film Festival. The film, by director Antti Seppänen, follows nARCHITECTS through the design and construction process of NYC's first micro-unit apartment building. Carmel Place wins the 2016 Innovation by Design: Spaces, Places, Cities Award. Mimi Hoang discussed designing housing and public spaces for cities in reSITE + Canal 180's Small Talks premiere. Carmel Place construction and details highlighted in the "Cost-Effective Building" issue of DETAIL. The Architect's Newspaper highlights Carmel Place in a discussion of micro-apartments and affordability. Eric Bunge participates in a discussion about this contemporary and ubiquitous movement, one that is increasingly influencing the exchange of goods, data, images, services, and spaces of residence and work. nARCHITECTS is among 30 international firms that participated in Storefront's Sharing Models: Manhattanisms. Participants conceptualized and created physical frameworks for inhabiting and constructing urban space and the public sphere. Principal Mimi Hoang speaks at reSITE 2016 discussing Carmel Place and nARCHTECTS' approach to affordable housing. Penelope Green of The New York Times documents her experience spending the night and having a dinner party in a micro-unit at Carmel Place. New York Spaces article highlights Carmel Place in "Micro Living: Macro Life"
Mimi Hoang & Eric Bunge receive an Arts and Letters Award in Architecture from the American Academy. Architectural Structures at Chicago Navy Pier + Urban Kaleidoscopes; Waterfront Seattle. nARCHITECTS' Carmel Place awarded an AIA NY Honor Award - AIA NY's highest level of achievement. Mimi Hoang and Eric Bunge present "micro-MACRO" as a part of the Fall 2015 Lecture Series. New interior images of My Micro NY featured on NYMag.com. Mimi Hoang speaks at Clemson University. Dezeen covers the release of nARCHITECTS' trailer of the short film highlighting the construction process of Carmel Place (formerly known as My Micro NY). Mimi Hoang speaks at AIANY's dialogue on housing at the Vitra Showroom. Eric Bunge participates in the sypmosium at the AIANY Center for Architecture, October 3 at 9am. Eric Bunge presents My Micro NY and discusses housing at the GSD. nARCHITECTS ranks 10th in Design in the 2015 Architect 50. Eric Bunge speaks at the AIA Tennessee Convention. Construction of the Cafe Pavilion is underway at Public Square in Cleveland. nA particpates in OpenStudios: Emerging Voices. nA featured in The Architecture League of New York's new book. MMNY featured on the Architects's Newspaper blog. My Micro NY featured in Make City, the 2015 AIT - Architecktur Salon in Berlin. My Micro NY featured in article "Leben in der Schuhschachtel" in Frankfurter Allgemeine newspaper. Mimi Hoang and Eric Bunge in Richard Schulman's latest book. Wyckoff House Museum in 'Saving Place' exhibition; opens April 20th. New photos of the Wave Wall, nearing completion at Chicago Navy Pier. nARCHITECTS named one of the 2014 Architect 50, ranked 7th in Design. MY MICRO NY, adAPT NYC competition winner, has broken ground. Canadian Architect covers My Micro NY in Living Small in the Big City. MoMA Rising Currents is featured in New Yorker Magazine. See nA's ABC Dbayeh Dep't Store in DETAILS 34. Eric Bunge talks about My Micro NY on CNBC. nA's Forest Pavilion, "Making a Theatre with Bamboo" in Lotus 152. Chicago Tribune announces $115M in public funding for Pierscape,by nA. Mimi Hoang discusses how My Micro NY is NYC’s "new housing model." nARCHITECTS' My Micro NY wins adAPT NYC competition. Eric Bunge discusses My Micro NY on The Today Show. nA's My Micro NY wins adAPT NYC Contest. Watch it on the Fox Business. Three nA projects featured in "We Build the City." Design by New York Exhibition at the W4th Street Subway station, by the Center for Architecture. nA named 1 of 20 "world's most intriguing young practices" in Wallpaper's Architects Directory. See Ordos 100, a film directed by Ai Weiwei. Official Selection International Film Festival Rotterdam. Two nA projects included in CHANGE: Architecture and Engineering in the Middle East. nA's MoMA PS1: Canopy project featured in "Material Strategies" book. nA has been retained as part of a team headed by JCFO for the $85M redesign of Chicago's landmark Navy Pier. Construction on the 500,000sf dep't store's facades in Beirut is progressing. Completion early 2012. Construction on 3,300' long Ellicott Park at the Buffalo Niagara Medical Campus is progressing. See photos of Switch Building featured in Lotus 147.
complex at the M. Fidler/Wyckoff House Park." DDC 2010 Award for Excellence in Design. in Design for Harper Street Yard." nA's work featured in the "Guide to Contemporary NYC Architecture." nARCHITECTS' work featured in new book, "New York Dozen." nA's project New Aqueous City featured in "Rising Currents"
nA comissioned to design an ephemeral pavilion for the Da Nung Da Fu Forest Art Festival in Hua Lien, Taiwan. large addition to the Beirut landmark." nA is in PRAXIS 11: "11 Architects/ 12 Conversations". Renderings and drawings of nA's Double-Ex House for Hometta are unveiled. MoMA Rising Currents opens. nA's "New Aqueous City" is 1 of 5 featured projects for NY's Waterfront. nA contributes a drawing to the Guggenheim for the Exhibition, Contemplating the Void. at Rafael Moneo's Souks in Beirut." MoMA PS1:Canopy & Windshape in "Provisional"
nA's Switch Building featured in "U.S. Architecture"
Damdi Press released DD series 29: "nA Monograph"